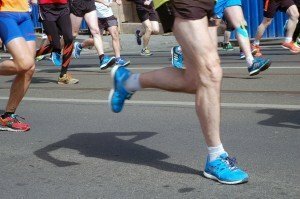 Do you take care of your Feet when you run? During running, our feet put under added pressure and they absorb more force than they are used to. Our feet propel us and it is the condition of our feet that will determine the outcome of our jog, run or marathon. So why is it that, a lot of runners, do not take proper care of their feet? Did you know that the foot is the 2nd most common injured part of our body after the knee? Running can lead to injuries and pain in the shins, knees, hips and lower back. So perhaps it is time that we start to pay some more attention to the importance of our feet. We treat a lot of runners in our clinics. The common complaints that runners arrive with are black toe, blisters, painful callus, numbing and burning. Most of these problems are caused by incorrect or ill-fitting footwear rather than the running itself. Shoes that are too small are usually the cause of black toe. Shoes that are too narrow can cause nerve pain. Shoes that are too big will lead to friction which will result in painful blisters. It is always best to buy your running shoes from a specialist shoe/running shop. Most high street shops sell only generic sizes. It can be difficult to find a running shoe that is a perfect fit. Clients who wear orthotics will require wider fitting footwear. You should always take your orthotics along with you when shopping for new running shoes. It is important to remember that your shoes can shrink over time. Drying your wet running shoes on the radiator or in the heat of the sun is a bad idea. The heat causes the material to shrink faster. Ideally, you should have a few pairs of running shoes so you can alternate shoes between each run. This will give the shoe plenty of time to dry out. The average life of a running shoe is 350-500 miles. You may need to replace shoes sooner if you are heavy, tall or if you have gait problems. You should have your feet measured every time you purchase new running shoes as your feet can change in size over time too. Shop in the evening time or after a run. Spend time examining and trying on the running shoes. Get your feet measured each time you buy new shoes. Take your orthotics and running socks along with you. Socks also play an important role in our running performance. Your feet may become blistered from wet or cotton socks. It is best to invest in a good quality running sock. You may need to experiment with different types of socks to find the ones that suits you best. The added pressure, weather conditions, and footwear can cause our feet to become very dry and cracked. Moisturiser is key to avoiding dry, sore and cracked feet. We recommend Flexitol and Gehwol foot balms and creams to our clients. It is best to apply cream or balm to your feet each night before bed and after a shower. Regular foot care is advised. Ongoing foot pain should never be ignored. Contact us if you are concerned about your feet.